Greetings my fellow Renegade Gardeners, and a gracious good morning, good afternoon, or good evening to you, depending on where you lurk and smirk amid horrific landscaping around the globe. Live from New York City, it’s the 2016 Renegade Gardener High Spot/Black Spot Awards! 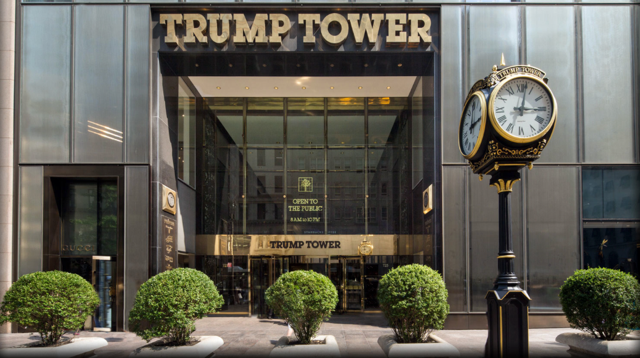 When one considers the recent presidential campaigns forged by the two candidates from both parties, the nonsensical words that came out of their mouths, the inane coverage by the media, and the shocking final result of the election, choosing the location for this year’s awards ceremony was both a literal and figurative no-brainer: Trump Tower. I love New York, but still am a bit disappointed; had Ms. Clinton won, we would have brought the award ceremony to the real, everyday American people, and held it in the Hamptons. 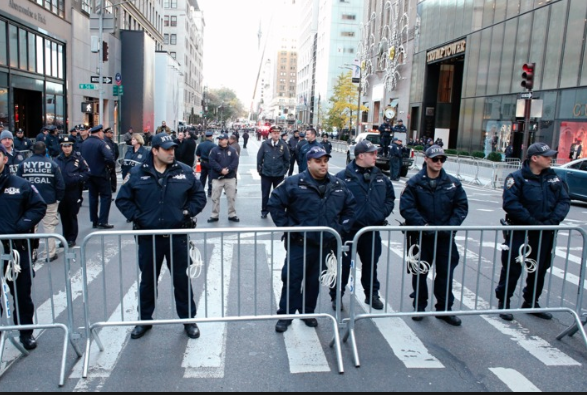 New York’s finest control the crowds arriving for the High Spot/Black Spot Awards ceremony. However, the great advantage to our location within Trump Tower is that the lobby and vast entrance atrium is of course crawling with reporters and news cameras from CNN, ABC, NBC, CBS, Fox and MSNBC, all scurrying about in hopes of catching a glimpse of The Great Man. But I’ve been sneaky, entering and exiting the building through a rear kitchen door to the alley. The only mild hiccup to the award ceremony beginning in a few minutes is that the planning committee was a little late in booking a banquet hall of appropriate size within the vast confines of Trump Tower. As I’m the head of the committee, I’m sure those of you who visit the website on occasion to see if the “monthly” update has finally been posted will understand completely. The only space available by the time we booked was a former employee-smoking lounge in the basement. It’s a bit small, but on the upside has been exquisitely renovated. On the downside, it still smells strongly of cigarettes. Good thing that all of Trump’s restaurants and catering facilities serve a thirty-dollar cheeseburger you can taste for a week. Luxury Suite at New York’s Americana Inn. Oh, and sorry about the official hotel also. 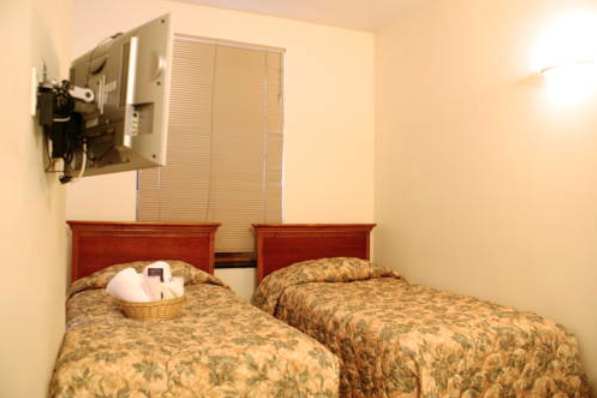 On such short notice, the only thing we could find with adequate rooms was the Americana Inn on West 38th. If you haven’t yet checked in, one little negative, the rooms all share a bathroom down the hall. On the positive side, most rooms do come with a cat to sleep with you. Please note, however, the cats are feral, sneaking in through a vandalized furnace exhaust vent in pretty good numbers now that evening temps in New York City are starting to plunge. You may not have a toilet, but there is a broom in every room. But enough excuses…let’s give out some awards! 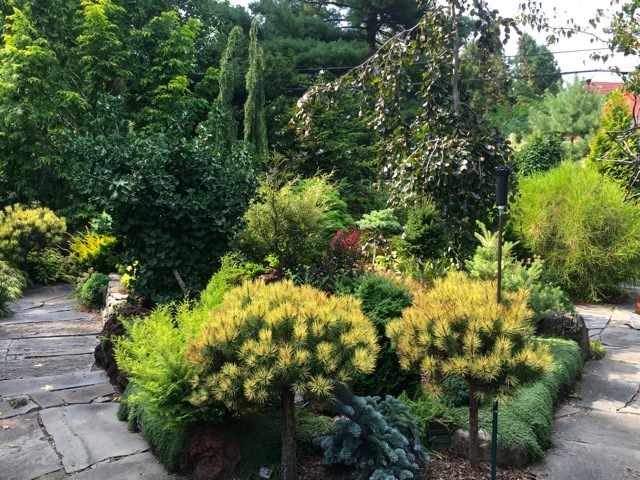 In September, this year’s judging committee had the great pleasure to visit the garden of Jerry Kral, nationally known garden speaker and teacher, longtime American Conifer Society member, and one of America’s greatest all-time conifer crazies. 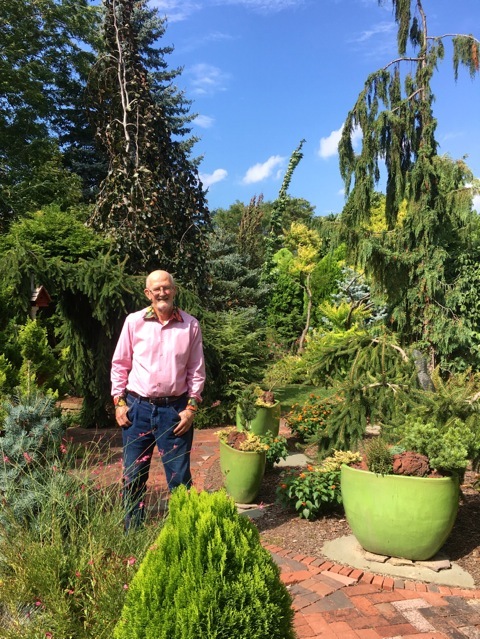 Beginning in 1983 and aided by wife Karen, Jerry has carefully crafted one of the finest collections of conifers in America, on less than two acres of property well within the city limits of Rochester, New York. Enjoy. Contrast in size, form and foliage abound. Meandering pathways lead to dozens of artful touches. 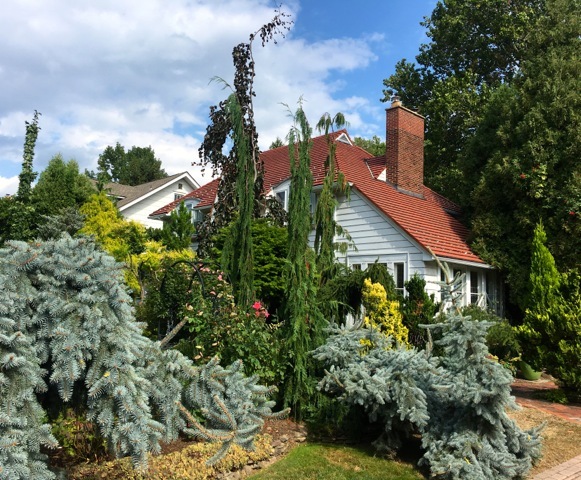 The Kral collection features over 350 different conifers. The Sunken Garden. Every stone in the garden was placed by Jerry. The one, the only, Jerry Kral. 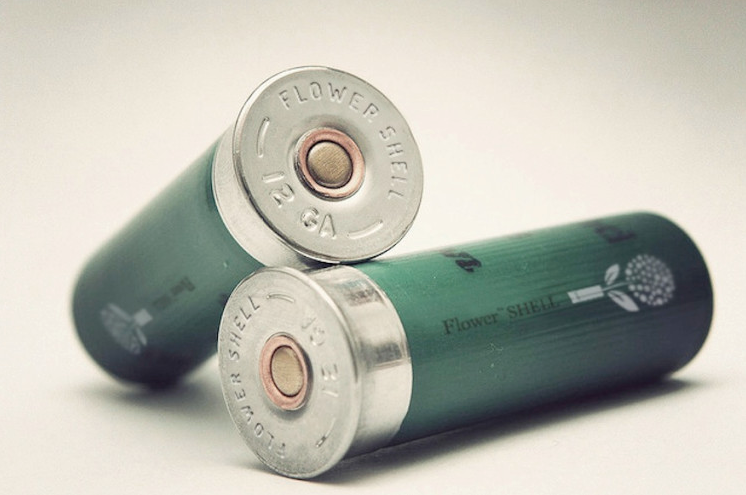 Swedish artist/inventor Per Cromwell has graced the peaceful gardening world with Flower Shell, a 12-gauge shotgun shell that is loaded with flower seeds instead of the customary steel or lead shot. Loaded into a shotgun, Flower Shells can be fired to forcefully scatter seeds far and wide or blast them straight into the ground. His company, Studio Total, claims the new product is, “a wonderful attempt to turn something designed for destruction into a creative, life-giving tool that could make the world a more beautiful place.” Not to mention the fact that instead of painstakingly placing single daisies into the barrels of National Guard soldier’s rifles—which is so ‘60s—present-day peace activists can simply hand out shotgun shells. Flower Power indeed. Which brings to my addled mind an even broader use for the product. Just think, you can now shoot pesky squirrels, rabbits, raccoons, the neighbor’s cat and other garden varmints while beautifying your landscape at the same time. While that darn rabbit that’s been decimating your vegetable patch is pushing up daisies, it will be, well, pushing up daisies. Heading back to Oregon’s famed Terra Nova Nurseries for this year’s coveted Perennial of the Year award, a most fetching newcomer featuring mounds of variegated foliage and rose-pink trumpet flowers artfully held above arching dark red stems. 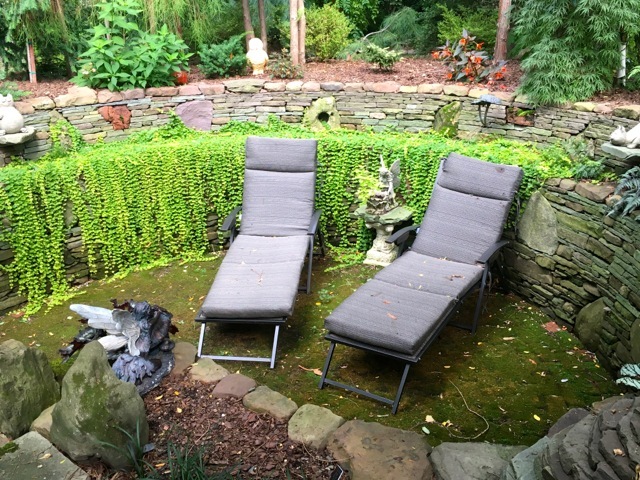 Plants thrive in sun as well as shade, with best reddish foliage color occurring in part shade. Plants burst from the starting gate in spring, with a flowering period of April through June. Deadheading somewhat extends bloom, but summer through fall the foliage keeps the show going, holding later into fall than plain Mukdenia. Fall color display is a fabulous red over green and gold tones. In the perennial garden it’s a terrific front-of-the-border plant; plant in threes or in swaths. 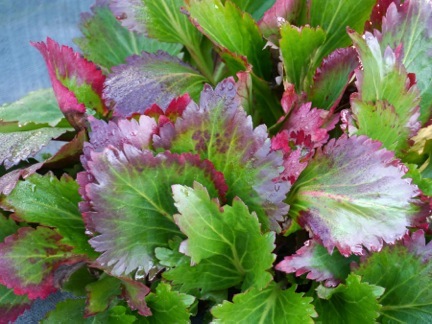 In shade I like to use it as singles scattered amid matting shade groundcovers or in combination with green ferns. Plants prefer slightly acidic soil that is well-drained with decent organic content. Hardy to Zone 3 with a growing range of zones 3-9. 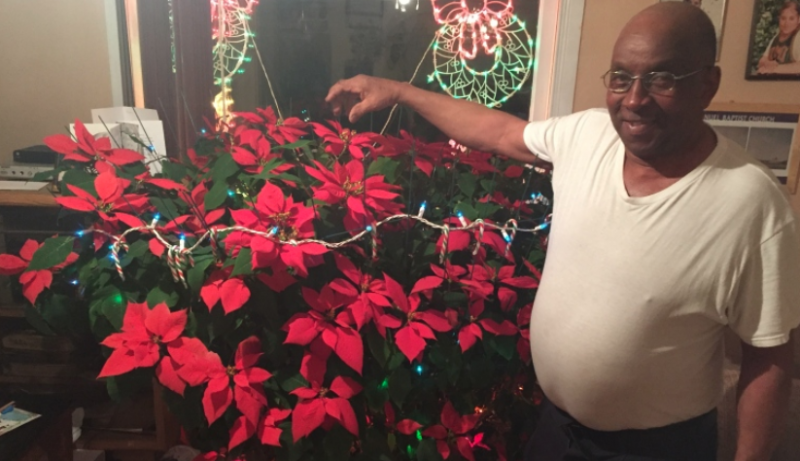 From the Canadian Broadcasting Corporation (CBC) comes this story of a phenomenally long-lived poinsettia that the owner has every reason to believe has flourished for 20 years as testament to the loving spirit of his late wife. Frankie and Maxine just days before her heart attack. 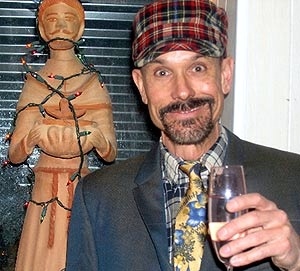 Frankie Allison of Halifax, Nova Scotia notes that his wife, Maxine, was thrilled to win the plant on Christmas Eve, 1996, in a radio call-in contest. 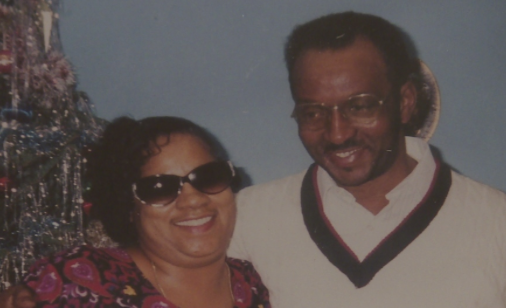 Three days later she died suddenly of a heart attack. Now, 20 years later, the houseplant measures five feet tall with a circumference of over eleven feet. The only care given the plant by Frankie is twice-weekly watering and occasional fertilization. Friends and family often remark that the plant’s extraordinary longevity is aided by Maxine’s loving spirit. Something certainly is going on—experts at Halifax Seed say it is exceptionally rare for a poinsettia not only to survive this long but flourish as a houseplant. “They say that it’s a miracle plant,” says Frankie. Each Christmas, the leaves turn from green to red, and the plant blossoms, filling Frankie’s living room with fond memories of his beloved late wife. 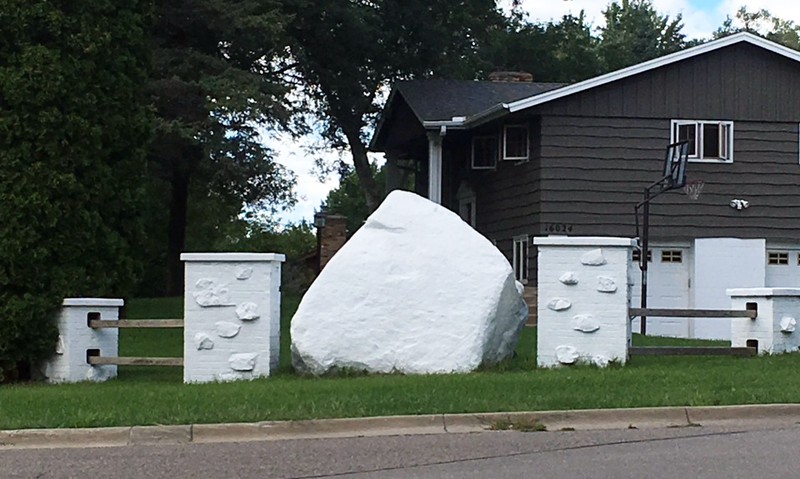 You know me, I’m not much for government laws, regulations and penalties restricting personal liberties, but if a whopping fine could be assessed to this homeowner for painting this mammoth Minnesota glacial granite boulder white , I’d be all for it. Don’t paint over natural stone. The point of natural stone in the landscape is to introduce the natural beauty and majesty of, uh, natural stone. 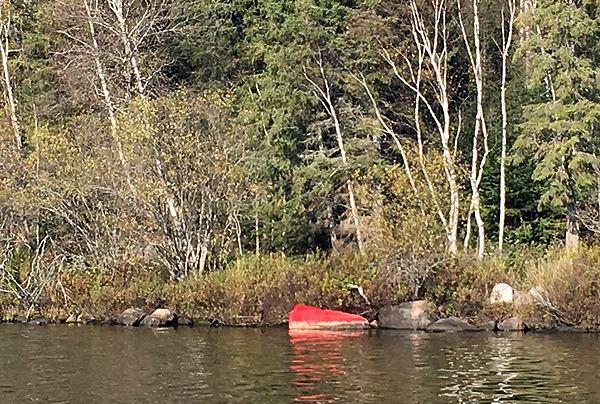 There is a cottage owner in Northwest Ontario near where I go who paints a wilderness shoreline boulder on his property red every few years, so he can call the cabin Red Rock, much to the consternation of the other cottage owners and especially the locals. I don’t care if you like it, no one else does. Finally, a helpful gardening product coming out of the runaway freight train that is modern computer technology. 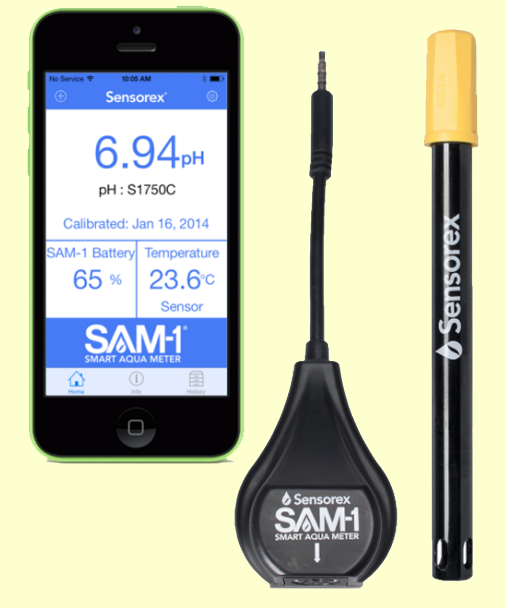 This simple-to-use device connects to your smartphone or tablet, and with insertion of the probe into soil, accurately reads soil pH, moisture level and temperature. Downloading the free app, your phone or tablet acts as the meter screen and enables one to save results, print them, add GPS coordinates or email results to others. What’s great is that the readings are highly accurate—this is not another wonky plastic pH meter that nearly always reads 6.8 in soils from Shanghai to Chicago. 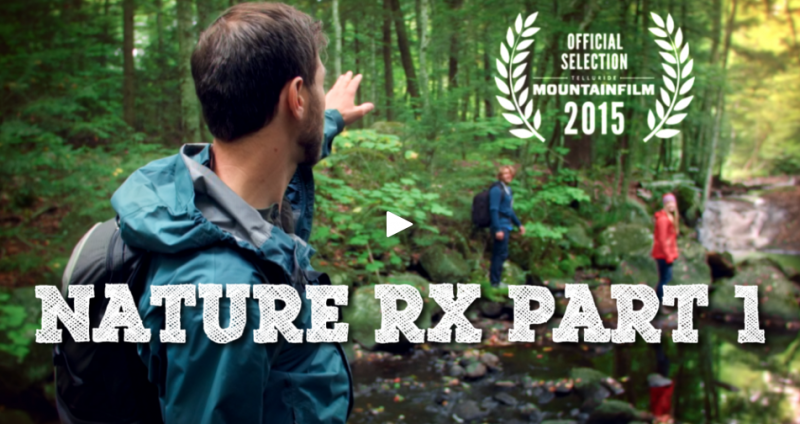 Uses are not limited to gardening—scientists are using the SAM-1 in field and lab tests, while field workers in municipalities are using it for monitoring drinking water, gauging pollution and other water tests such as ORP (oxygen reduction potential, such as testing chlorine levels in a pool). That’s all it took to rally dozens more extremists to hurl volleys of protests at their beloved Whole Foods Corporation. Whole foods yanked the peeled product—comprising a tiny percentage of the millions of oranges they sell—and apologized. 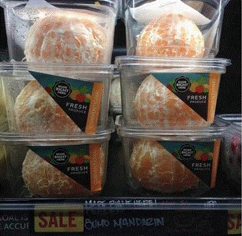 This prompted other customers to come out in favor of the packaging, theirs views unacknowledged by Whole Foods. 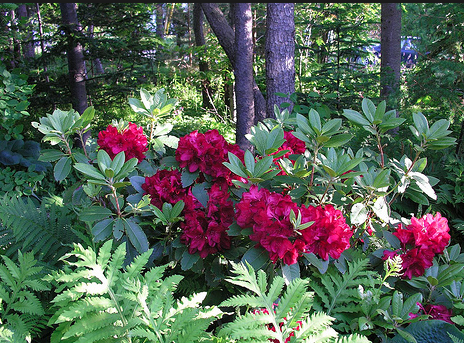 Before most of you conclude I’ve lost my mind—a plant blooming in red is Shrub of the Year?—hear me out. ‘Firestorm’ is one of the newest releases from Monrovia Nursery’s Raise the Roof® series of rhodies, and it’s remarkable for its many positive attributes. 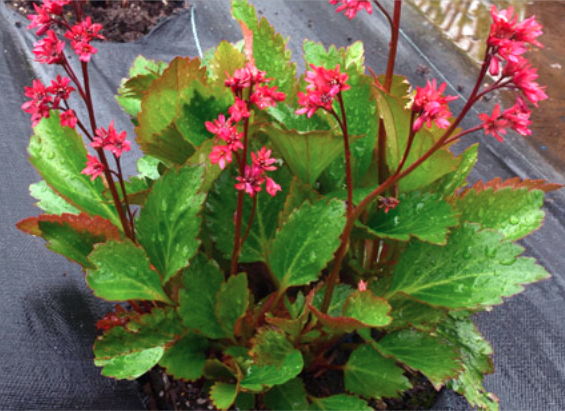 First, it’s petite, maturing to a mere three feet tall in ten years, making it ideal for smaller landscapes as well as single specimen use as a focal point in larger landscapes. Second, the attractive elliptic evergreen leaves emerge lime-green, then darken throughout the season. Third, it’s a tough, long-lived little shrub with rock-hardiness to Zone 4. Now, about the bloom color—it’s about as red as red gets, and the wavy-edged 3+” blossoms appear in dome-shaped trusses and in great abundance as the plant matures. Which simply means you don’t need to buy and plant many! 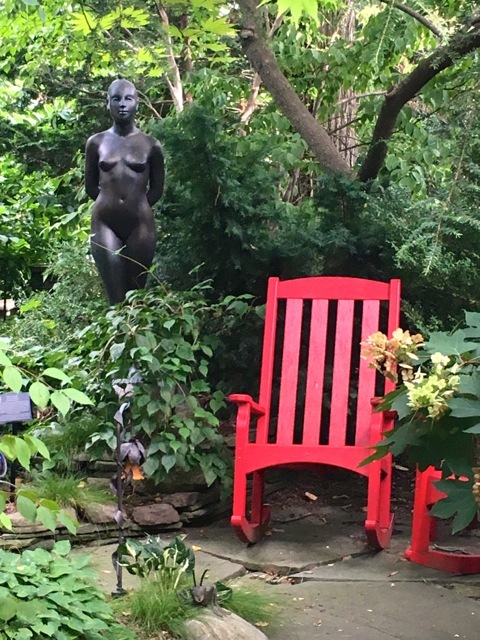 A little red here and there in the garden is a fine thing, as long as you recognize that red flowers on plants have led many a young gardener down a long and thorny road to utter despair, frustration, ingratitude, depression, drunkenness and moral depravity. (If new to the site, and you want to know what that’s all about, click here. 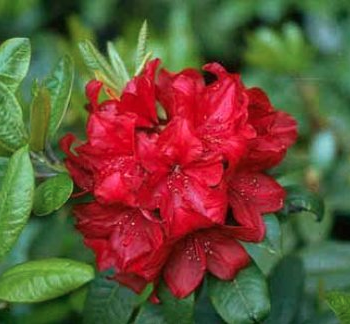 ‘Firestorm’ is another exceptional cold-hardy rhododendron stemming from the work by Gustav Mehlquist of the University of Connecticut, who began cross-breeding rhodies to achieve better cold-hardiness and disease resistance in the late 1960s. 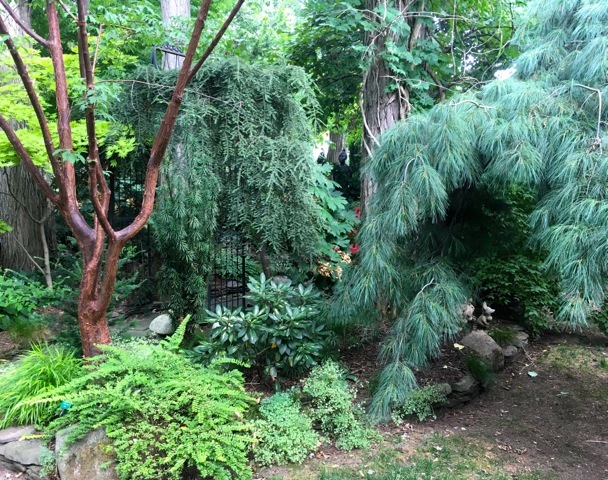 Plants perform best in part shade. I like to plant rhodies where they receive ample morning sun then a respite from intense afternoon sun. Four to five hours of direct sunlight is a good range. 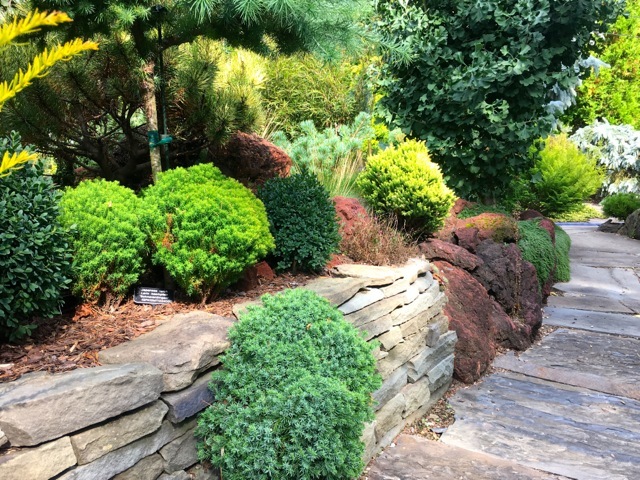 Unless blessed with loose, well-draining acidic soil, one will want to amend the soil with organic material as well as the addition of some sharp sand to aid drainage. If you have heavy clay, dig it all out and replace with well-draining garden soil. One will also want to get a soil test, and amend soil with additives such as soil sulfur to lower pH to 5.5-6.5. Yes, it’s a rhododendron, and I’ve long stated that rhodies should be sold with a black-on-yellow tag reading, “WARNING! This Thing Requires Gardening!” The extra effort is always worth it. ‘Firestorm’ blooms in late spring and is hardy to Zone 4. It’s a mainstay of the American media, the 12 most pesticide-laden fruits and vegetables available to consumers each year. When the list is published, more than a few of your well-intentioned (yet wholly ignorant) Facebook friends will publish it, with a breathless warning to avoid such things as conventionally grown apples, nectarines, peaches, grapes, cherries, spinach and tomatoes. Pay no attention. It’s a complete scam. 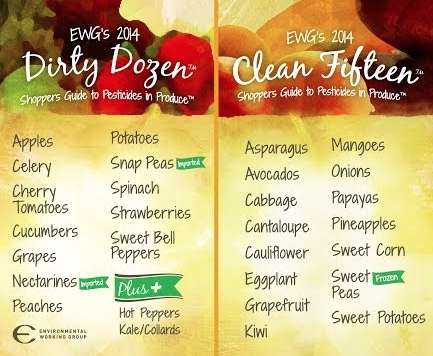 The list is produced by The Environmental Working Group (EWG), an organization that purports to, “help protect your family from pesticides.” So many food scientists from around the world have debunked and discounted The Dirty Dozen list over the years, you’d think that the false claims by the EWG would no longer be reported by the media. Except the media is as clueless as much of the general public. This year, both CNN and the Huffington Post reporting the findings in the EWG press release without a thought toward fact-checking or investigating the claims. In his wonderful blog “Applied Mythology,” scientist and food expert Steve Savage has this to say: “Each year, the EWG takes the pesticide residue results published by the USDA, which confirm the safety of our food supply, and misrepresents the data to say otherwise.” In a nutshell, Savage (and plenty of others, from university scientists to experts at the USDA, if you choose to research the false claims made by EWG online) point out that the EWG “Dirty Dozen” list is created by non-scientists using their own brand of “analysis”—which real experts have rejected as utterly unscientific. In 2011, scientists at UC Davis did an analysis of the EWG list and concluded it was “seriously flawed.” Exposure to what the Environmental Working Group determined was the 10 most frequently found pesticides were at such low levels as to be “negligible.” They also found that the methodology that the EWG uses was insufficient to allow for any real ranking among the produce being tested. Methods used by the EWG were so haphazard they could have ranked the foods tested in any order they chose, because the amounts of residue contained were so miniscule it didn’t make any difference. But the annual list plays into the hands of the EWG well. Go to their website right now—I won’t link it—and you’ll see that their home page is devoted to a massive year-end donation campaign. Click on an article, and you’ll get a pop-up asking for a contribution. Well, follow the money. Like so many peripheral, quasi-scientific websites purporting to promote healthy eating, the EWG is a pro-organic, anti-GMO consortium that has found a niche—and a way for its small staff to make a living—by tapping into the ignorance of the American public. Of course fruits and vegetables are sprayed with pesticides (well, for now, anyway—introduction of GMO foods has greatly reduced the use of pesticides in the US and around the world). If they weren’t, we would all starve. The EWG rather conveniently ignores the fact that organic fruits and vegetables are routinely sprayed with pesticides, some of them more toxic to the soil and to humans than the safer synthetic pesticides used by conventional farmers. Most important, the fact that miniscule amounts of pesticide residue (in both organic and conventional foods) have no adverse impact on one’s health is ignored. No one is becoming ill from eating food sprayed with pesticides. Strolling a city street at rush hour you will encounter far greater doses of toxic chemical pollutants that in massive daily doses would potentially harm your health than ever you will encounter in food from “The Dirty Dozen” list. Unaware, apparently, that many organic varieties of sweet corn and papaya also are grown from GE seed stock. As I said, utterly clueless. That this ghastly product came into being was no surprise; the gardening industry never fails to simplify, and thus ruin, every natural, artistic achievement by humans requiring skill, patience and effort (see: concrete retaining wall block). It’s just that they arrived in the marketplace so damn fast. The clownish, horrifically comedic “sculpture” product that you see in the photos is brand new to the market. 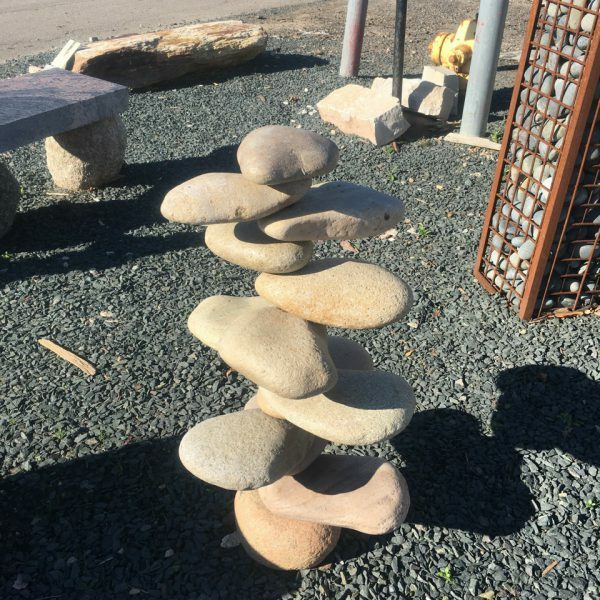 Often being sold as “Stacked Stone Sculptures,” you can find them at nursery centers, landscape supply yards and even on eBay. 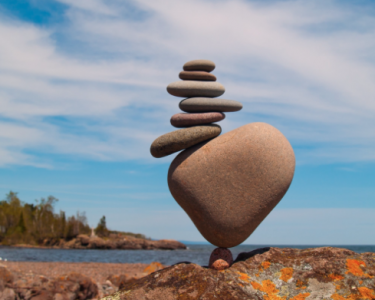 What allows the stones to stay “balanced” despite their absurd appearance (and disregard for the laws of gravity) is the fact that each stone is drilled. A stout, vertical steel rod holds the whole thing together. 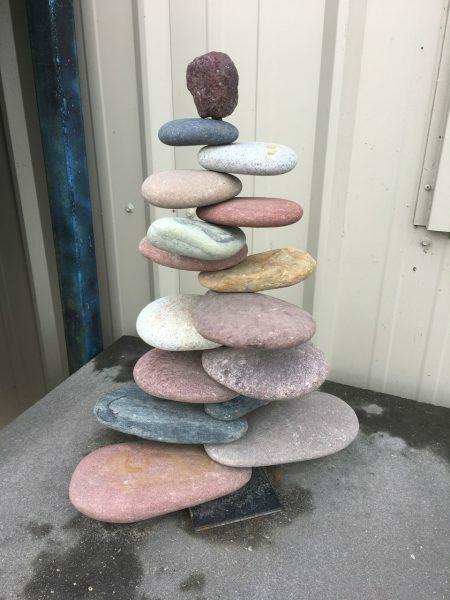 Stone sculptures such as these can and are placed in the garden and places of prominence in and around the home. 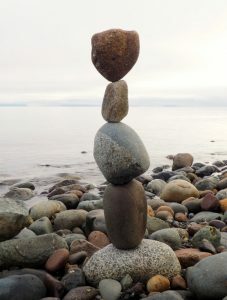 Yes, they can fall over, in wind or rain, although one can create more solid balances using faceted stones that dignify and mystify their surroundings for an entire season. If they fall over, you rebalance them. So you see the problem. 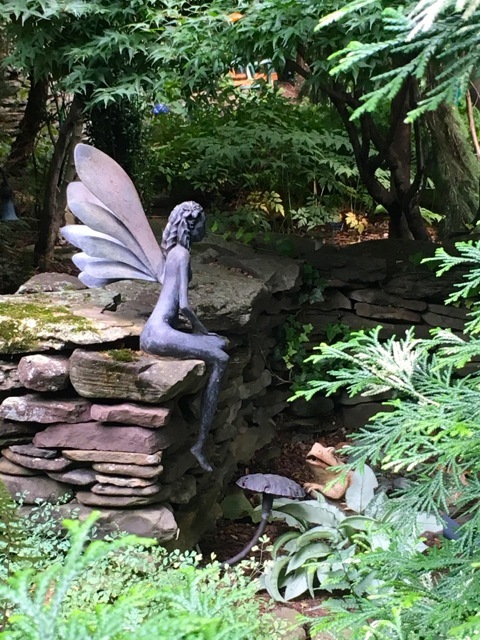 What the gardening industry is selling as stone art is the equivalent of a Picasso rendered in crayon for you to proudly hang on your wall. 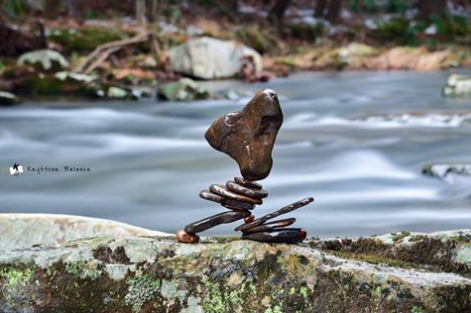 I’ve done some stone balancing; it is an incredibly mesmerizing, zen-inducing hobby that completely captures one’s attention and will. Now, of course, it is available to everyone, in a lowbrow, perfunctory form that voids any inclusion of skill, perseverance or achievement. And cool news! David Cassidy has just taken over the lead role from the overrated Neil Patrick Harris! HOPE YOU NOTICED, this venerable 20 year-old website has just been UPDATED to a new, state-of-the-art format. Most of the content from the old site has been transferred, with the exception of not QUITE having finished moving over Myth of the Week, Don’t DO That and the columns under Care. And you may find the occasional gremlin in the works while we move more than 400 pages of copy and photos. All should be good in a week or so. Current Column will be updated on February 1. Seriously.